This morning, the Ormewood Park neighborhood of Atlanta probably looks a lot like it did sixty years ago. 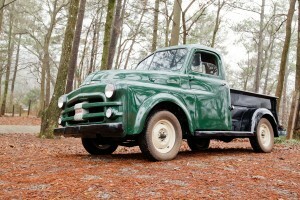 It was then, in 1951, that my neighbor Rebecca’s Dodge B3 pickup was brand-spanking new. This green and black “Pilot-House” half-ton was built when Americans were buying vehicles and suburban homes and televisions for the first time.